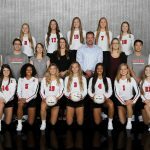 Tuesday, October 10, 2017 6:30 PM Lovejoy High School AWAY 3 Royse City High School HOME 0 Game Recap Lovejoy swept the Royse City Bulldogs Tuesday night 3-0. The night was highlighted offensively by 5 players hitting over .500%. Rachel Langs and Mattie Boyd both hit over .800% and freshman Cecily Bramschreiber hit over .600%.